This is a well-painted eighteenth century portrait of a blue-eyed gentleman in a powdered wig wearing a blue coat trimmed with gold braid and a matching waistcoat over a frilled chemise. 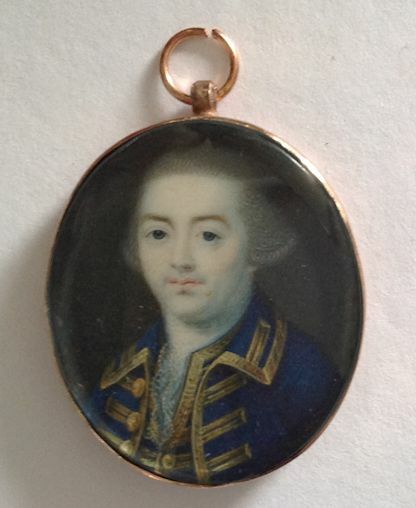 Watercolour on ivory, signed and dated on the obverse ‘Hamn 1766′ and set in a gilt metal frame. Fine condition. The son of an Irish vicar, Gustavus Hamilton studied at the Dublin Society’s Drawing Schools. He spent all his working life in Dublin where he attracted a fashionable clientele.